We offer turnkey properties to buy in the most desirable locations in Barcelona City, its surroundings, by the Sea or the Mountains. Our exclusive portfolio includes Penthouses, Palaces, Castles, Masias, Equestrian Estates and Contemporary Homes depending on the particular lifestyle you are looking for. We are well aware that buying a property is always a complicated decision. Not only because it is a great investment, but also because it requires information, knowledge of the sector and, in many cases, speaking the same language so that there are no misunderstandings when it comes to information, or taking action. At Keyz we accompany our customers throughout the entire purchase process. We explain each step of the way and guarantee maximum professionalism. We collaborate with lawyers, architects, designers and all types of qualified personnel to find the best solution to your needs. We are aware that selling a property; be it a mansion, an apartment, a villa or a penthouse is never easy. Which is why our team of Professionals and Analysts are experts at sellecting, through our wide database of International Clients, the right buyers for each property. Also the needs of each vendor are always different. Which is is why we can adapt to their interests, offering a profesional approach that is thorough, honest & effective. We maintain a constant and close relationship with our International Buyers. Clients who are looking to buy luxury properties in prime locations. Which is why we offer a selective purchase process, filtered according to the buyers’ interests. There are cases whereby Owners don´t wish to have their properties on the market. 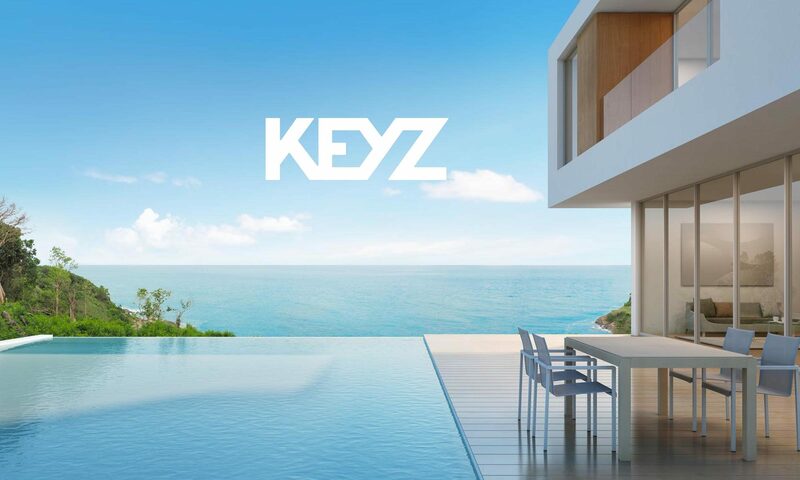 At Keyz we perfectly understand their reasons, and we offer the option to have their property promoted in a completely discrete and confidential manner. If for whatever reason, as a Buyer you don´t find the property you are looking for on our Website or International Channels, one of our Agents will be able to assist you and try to offer you the possibility of accessing our off market properties as well. Buying a property is always a very important investment, and if it takes place abroad, it can even be more significant. At Keyz we are aware of this, and that is why we offer a detailed buying guide for our customers. We accompany our clients with every step. We explain everything in detail to each of our clients in their native language, including what documents are necessary to process the purchase of a property. We also offer our experience and knowledge to find the solutions most suited to their needs. When purchasing a property, there are a number of essential legal services needed. In Keyz, we provide reliable professionals so our clients experience a legal process that is clear, simple and efficient. All costs and items such as government fees, fees, taxes, insurance and commissions are explained in detail. We provide all the necessary information and explanations that our clients need throughout the process. The objective of the law is to attract entrepreneurs to Spain, and stimulate foreign investment in Spanish real estate, public debt, and job creation. This law enables non-EU nationals to qualify for residency permits in return for investing in Spanish real estate (and other assets), leading to long-term residency in Spain once certain conditions are fulfilled. Spanish residency, and the ability to travel freely in the European Schengen area (for 90 out of every 180 days), will be a major attraction for many non-EU investors. Added to which, Spanish property prices have crashed into bargain territory, creating some excellent investment opportunities. It’s an attractive combination of residency and bargain prices for investors from outside the EU. Spouses and underage children are allowed granted residency permits at the same time. A great property investment opportunity in Barcelona’s real estate market with a high potential for revaluation in the future. Second residence in one of the most attractive cities and regions worldwide. Legal and civic safety in a country within the European Union. The right to travel without a visa to 26 countries within the European Schengen area. Residency permit holders are authorised to work in Spain with noadditional authorisation required. Keyz is an international real estate agency. A boutique specializing in the sale of renovated and newly built properties located in privileged areas of Barcelona, ​​its surroundings and the Costa Brava. Our service is characterized by very meticulous selection of properties that meet high quality standards fulfilling the expectations of our customers. Ensuring that all the information provided is accurate, descriptive and answers every question. The end result guarantees a much more efficient process of “match making” and allows Keyz to fulfill the Client’s needs in a time and cost effective manner. Our client referrals are the key of our success. Our firm commitment to understanding our client’s needs and only with an honest and clear approach, will they speak of us to and consequently become our ambassadors. When it comes to investing a significant amount of money in an asset, the credibility of the company is everything. We are aware that this expectation can only be met if our team provides an impeccable service. Therefore, we offer our deep knowledge of the market and answer any question, detail or query our customers have throughout the purchase process. Thanks to our local partners, and a collaborative mindset, we position ourselves as an International point of reference with a broad protfolio of high end properties situated in the Barcelona City, the outskirt and Costa Brava markets. We believe that we can only be the best in what we do by surrounding ourselves with the top firms in their fields. This is why we always offer, without any sort of commitment, Companies that we trust and that can guarantee our Clients an efficient, competitive and trustworthy service. All of this of course in their own language. The decision of buying a home with us means making a lifelong investment. That is why, our objective is to offer an examplary service, that allows Buyers to gain complete confidence in the property they are to purchase, a clear understanding of the process and the market in order for it to become straightforward and enjoyable experience. The real estate world may seem complicated, and we want to make it easier for you. So if you need any information or have an inquiry, please fill out the form or, if you prefer, we can call you. We will be delighted to assist you.